We made it to the new Neely’s BBQ Parlor during their very first week of being open in their new east side location. 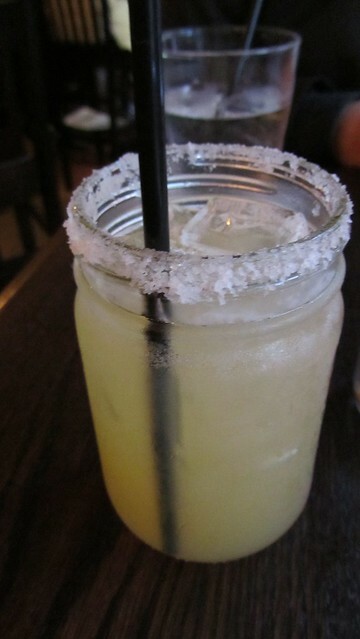 Let me just get the sad story out there now, the very beautiful Mason Jar Margarita was superb and sadly the best thing on our table. It was a Friday night (again let me emphasize it was their 1st Friday service) and surely every table in the house would be booked but Paul was leaving work later than planned so I had to cancel our reservations at Butter [note to self: make another reservation] and he got the bright idea that we should head over and see how long the wait would be. Every table was booked, as expected, but the hostess said the full menu was offered at the bar. Note, the wrap-around bar was beautiful but the really nice thing was all the actual high top tables, one of which was situated in a window and empty! We snatched it and eventually got service. I say “eventually” because after all our “how was your day?” and “I can’t believe we got a table” conversations dried up we realized it was really a long while before we got a menu. Yes, we had to share a menu, is this an aspect of poor planning or were people really walking out the door with the menu all week? The ambiance was lovely, dark wood tones everywhere, homey paned windows, and the staff, although slow to arrive was extremely pleasant. I give the bussers high praise for continually maintaining clean tables and full glasses. The servers on the other hand seemed confused at best, but were clearly trying—poor management/training? 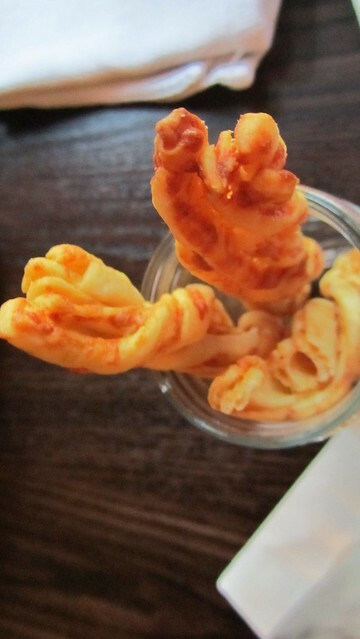 Curly cheese sticks were set on our table as we waited, think cheese puffs but fancy and in a mason jar. They were good but not really my ideal pre-dinner snack, although after the wait it was a welcome treat to have something to eat. For my main course I opted for the Chicken fried steak with mashed potatoes and mac ‘n’ cheese. I realize that’s a lot of processed bits on my plate but what the heck, it was Friday! The meat was well seasoned but somehow slightly mushy. The mashed potatoes had the worst texture possible—grainy and mushy—but they tasted like butter and who doesn’t love butter? This love of grainy/mushy otherwise unforgivable mashed potatoes was amplified by my disgust at the mac. Seriously, I LOVE mac ‘n’ cheese but this was just dreadful. My portion came in a very cute and tiny cast iron pan all it’s own but the beauty stopped at the pan and didn’t convey any further. I kept tasting it, hoping against logic that it would somehow be better. I wonder if I just got a bad bit though because other plates that passed me had the mac right on the plate and theirs didn’t look so dry or old. They just opened and yet I was questioning how long the mac had been on a counter. Bummer. I won’t even go into what Paul had because it was all just too disappointing. I emphasize that it was their first week and the kinks were still being worked out. We’ll likely give them another chance (eventually). 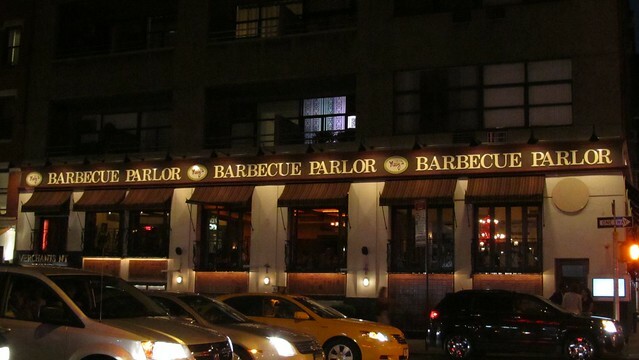 1 Response to Neely’s Barbeque Parlor.